Okay folks, last warning- the blog has moved! Here is a link to the most recent blog article. I will only do this a few times, so please change your bookmark over to the new location. I have been working hard to revamp my web presence, and as a part of that (drum roll please), I have finally combined this blog and my website. The new home of Kate Presents will be here. Same rambling (oops, I mean, relevant) content, just a new location. I hope you all decide to follow me there! Thanks, readers! I appreciate you all and hope to see you soon with plenty more Kate Presents ramblings, I mean articles! If, like me, you are a little obsessed with Mid-Century modern, I think you'll love these planters by Steel Life! I love their atomic-age look, their playfully bold colors, and their wonderfully unique shape. The top two images are of their Shallow root vessel. 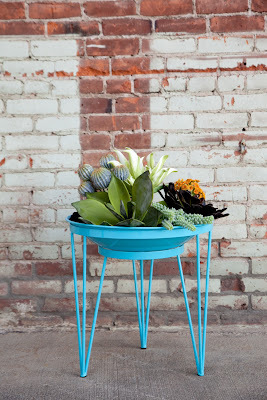 It is perfect for succulents, cacti, or grasses. Because of its long legs, it helps elevate unique small plants up closer to eye level, so it is the perfect choice for showing off finer-textured specimens. But my personal favorite is the Matchstick planter (last image). It comes in a small and large size so you can make a grouping with two of them. Don't you love how the earthiness of the wood contrasts with the smooth bright basins? I feel like they embody everything that is attracting people to Mid-century design right now: the nice lines, the iconic forms, the optimistic color.... in fact the general optimism of the early sixties is something I feel like we could all use a splash of right now, and aren't these just so splashy? I'm getting one for my office, which is in a Mid-Century building and is currently painted red-orange, teal, and lime green. I think they'll fit in just fine! © Kate Wiseman 2012. In San Diego? Want your own waterwise landscape design? I'd love to help! Please visit www.sageoutdoordesigns.com for more info. I have designed quite a few outdoor kitchens, and I will admit that I have my own favorites amongst them. This is one of them- it is a simple barbecue island but the difference is in the details (as always, right?) and I love the details on this island! Hopefully it shows in the photos that the island curves slightly. It is built to be dual purpose- not only is it a barbecue, it is also a retaining wall. The garden space here is very small, so I had to use every trick up my sleeve to max out the amount of outdoor living we could squeeze into the space while still leaving room for plenty of plants (if you don't save room for the plants, no outdoor space will ever feel all that relaxing and comfortable). I also just adore the materials: a poured-in-place concrete counter, stained a dark chocolate brown and sealed with an epoxy sealer for that hard-as-glass look, Syzygy tile mosaics just under the counter, and a clean smooth stucco on the sides. The paving that you can see just a little is a colored concrete that has a top cast finish to give it that sandy look. You all know that I really believe that outdoor living is the way to go in San Diego, and this garden is just such a great example of how you can fit a lot of it into a small space. We found room for an outdoor diningroom, the barbecue island, a fire pit (which I might post for you soon....) with its own lounge area, a hot tub with its own little patio, and there is still room to wander around the garden, grow a few citrus, and let the dogs out into a dog run. Not bad, right? Want to see what it looked like before? The before photo is at the end- take a look! And thank you to JCMS Landscape, who built the project! I have a few more photos of it up on an ideabook on Houzz, you can see them here. I stumbled upon Pinterest fairly recently, and I will admit that at first I thought it was silly. Pinterest is a way to easily grab photos from around the web and share them. There are lots of photos of cute puppies, rainbow layer cakes, and new ways to put on eye-makeup. I wasn't impressed. 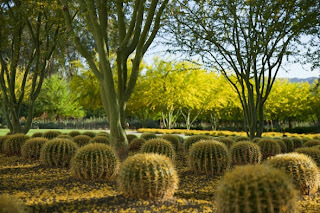 But then I realized that there are a lot of amazing garden photos on there if you go looking. And it is an easy way to browse through images looking for inspiration, something I love to do! Eventually it also occurred to me that it is a great way to group photos and start making folders of garden styles. My eventual plan is to use the folders as a tool to show homeowners what style of garden might work with their home. That plan might take me a while to execute, but here is the beginnings of it, if you'd like a bit of eye candy: Kate Presents on Pinterest. What about you, do you use Pinterest? Have you come up with ways to use it that are about more than just looking at puppy photos? Do you take your work home with you? I think that everyone imagines that a landscape designer probably has a huge garden just bursting with plants. Some do, but I fall much more in the category of not wanting to take my work home with me. So instead of a burgeoning garden, I have a few carefully picked pots on a small balcony. And I love it that way. One of my clients started calling all of her new plants her "dependents" and I guess I think of it that way, too. So these pots are the few dependents that I have deemed worthy. 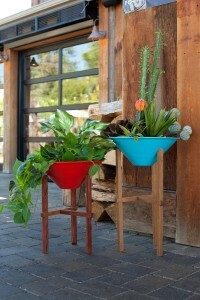 The pots themselves are from Planter Paradise in El Cajon. It is the best, and most affordable, pottery store in the County. Hands down, no arguing. Their pots are at least 50% cheaper than everywhere else, and about 100% cheaper than buying pots from a nursery. If you go, and you really should, say hello to Robert for me. He's the owner- you will not believe how many pots he can squeeze into the trunk of a Toyato Yaris. Really, it's a skill. 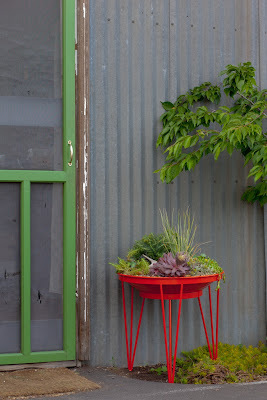 So, in the teal square planter, I have my newest dependent, Pennisetum spathiolatum. It came from Green Meadows and I love how the seedheads dance above the foliage. The next one is my culinary herbs: thyme and rosemary. I also have cilantro, tarragon, oregano, and sage. With those around, my inner chef is satisfied. My succulent planter has Sedum Autumn Joy (a little past its prime) and sedum morganium, with a little Echevaria peeking through. My new succulent bowl has my favorite little Aloe, Aloe Doran Black, with a few friends. What about you? Do you take your work home with you? Kate Wiseman is the principal landscape designer at Sage Outdoor Designs (www.sageoutdoordesigns.com). Sage offers residential design services and construction management. Her specialties include drought tolerant designs, xeriscaping (often mistakenly spelled zeroscaping), and modern landscape design. Kate has been widely published both locally and nationally and has won numerous awards for her garden designs, including the San Diego Home and Garden magazine's Garden of the Year award in 2007. Interested in a waterwise garden of your own? Please go to www.sageoutdoordesigns.com and fill in the contact us form. All content in this blog © Kate Wiseman 2012. Save the Dates for our next OFG Series! Welcome to My Organic Garden!